I take good care of most of my tools and equipment, but my garden hose is an exception. I think it’s because we share a mutual dislike. The hose kinks when I uncoil it, then tangles and resists when I try to put it back neatly. And the connections between hoses and nozzles always manage to hit me with a well-aimed spray to the face. I get my revenge by doing stupid things that make the situation worse, like leaving the hose outside all last winter. However, after evaluating the Gilmour LeakFree Starter Kit – and staying (mostly) dry in the process – I have undergone a very positive attitude adjustment. 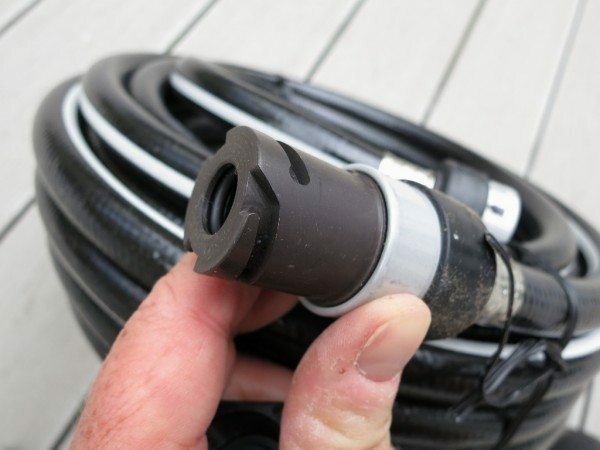 The connector is certainly more complicated than your standard threaded garden hose! Let’s take a closer look at the components and how they fit together. Here is the basic hose. It is described as heavy duty, and I found it fairly easy to work with while being stiff enough to resist kinks. 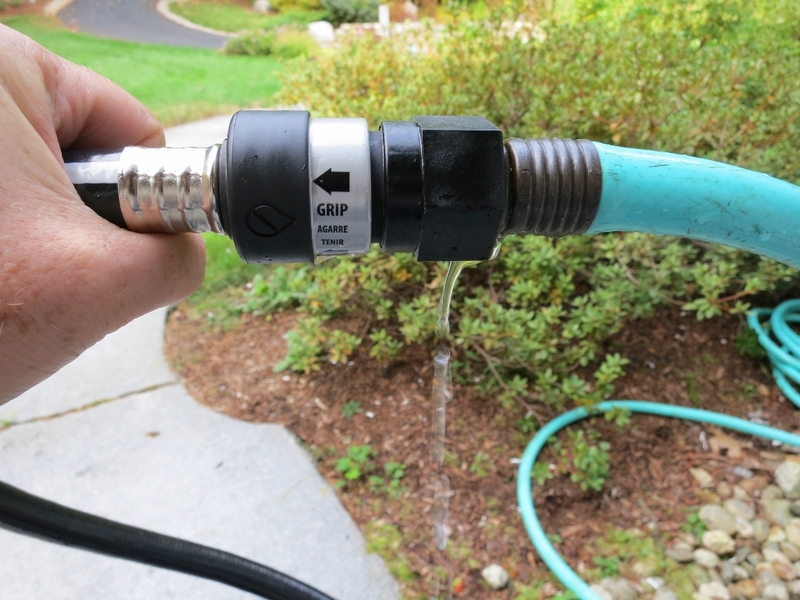 It is rated to 400 PSI, so you’re not likely to create a leak with your home water pressure! It looks like it will both hold up and coil better than my existing hoses. The main difference, however, is those funky-looking connectors at either end. On one end is this connector. 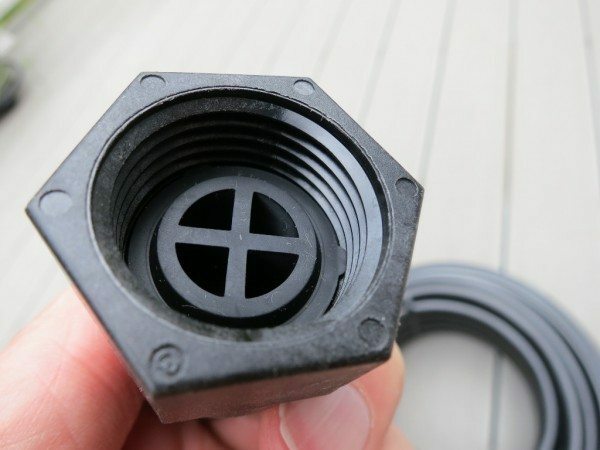 This attaches to the faucet adapter or other hoses. It is the same connector found on the accessory attachments. Below is a view of the inside. The rigid tube mates with the other connector, guided and locked by the pins on the sleeve. The pins slide into the grooves that you can see in the picture below. Once you’ve done it a time or two, it’s literally a snap to make the connection. Fitting the connectors together opens the check valve that provides the auto shut-off capability. Automatic shut-off when changing attachments could be the key feature driving your purchase of this system. 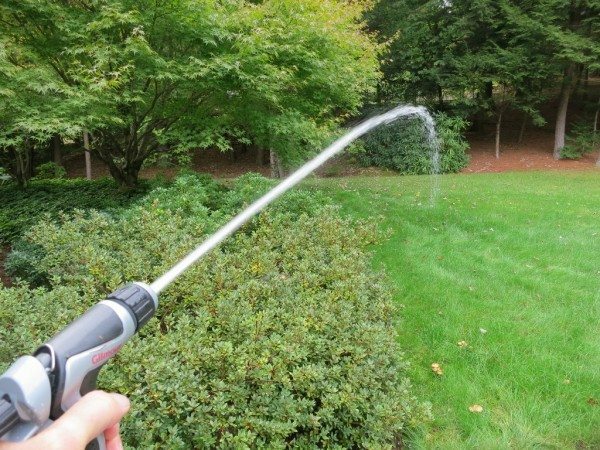 It saves the trip of running back to the faucet to shut off the water when switching from, say, the handheld nozzle to a lawn sprinkler. 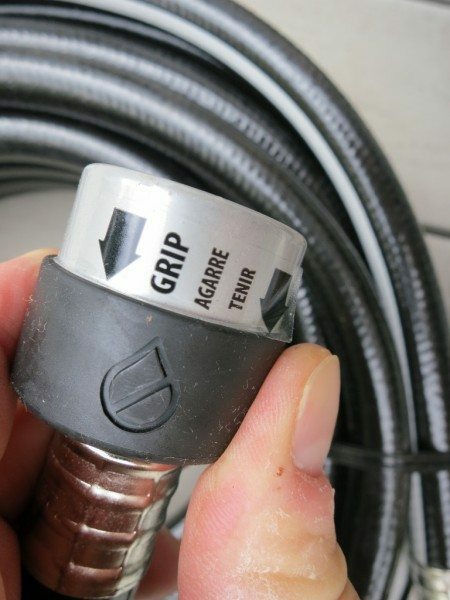 (Yes, you could also bend the hose back on itself to crimp off the water flow, but that’s not good for the hose – it can create a weak point that will kink at a later date.) Below is a photo of the hose after removing an attachment with the water still turned on. You can see water, but none is flowing out of the hose end. 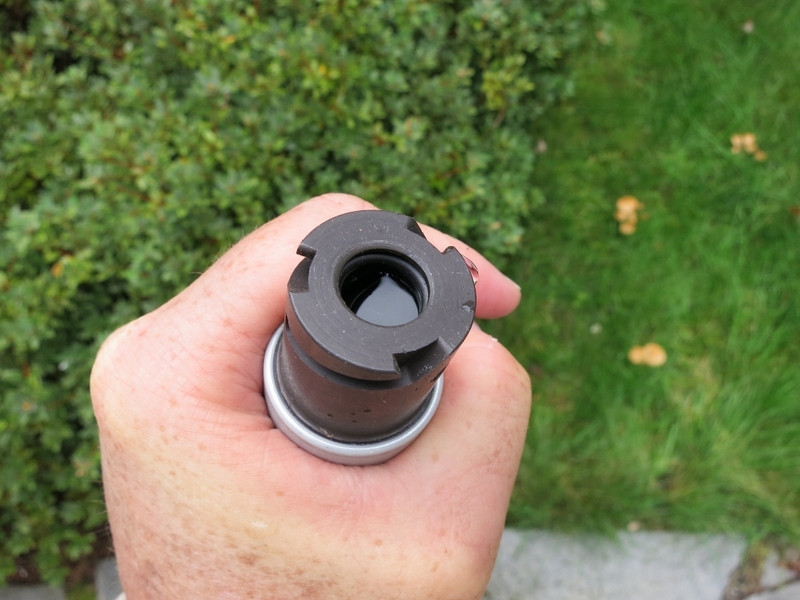 Some water will drip out of the attachment when it is removed, but you can avoid getting wet because the water doesn’t drip onto the quick-connect sleeves in your hands. The only drawback of the auto shut-off feature is that you lose the ability to free-flow water from the hose, such as I’m used to doing for slowly soaking the soil of a new planting or getting a refreshing drink of water. The only way to deliver water is through an attachment. 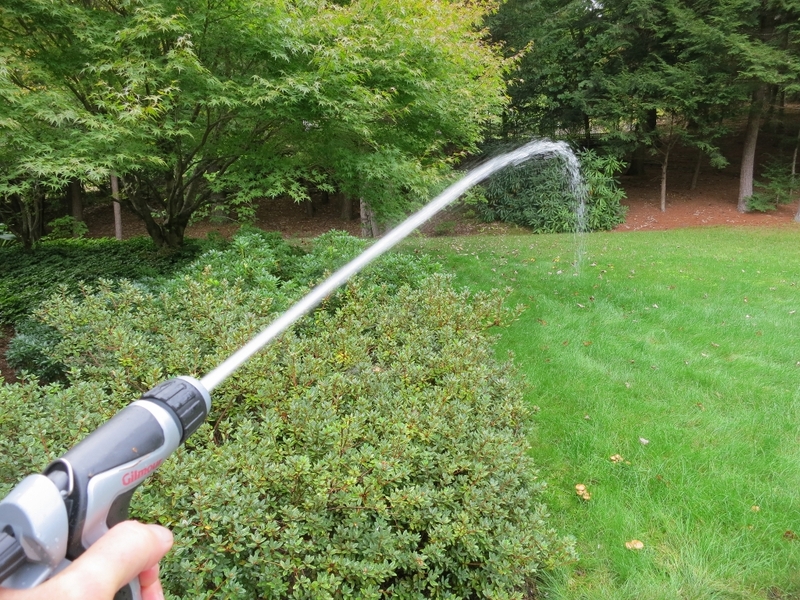 Speaking of attachments, here is an action photo of the spray nozzle provided in the starter kit. This is the full “jet” stream which, with my well pressure, travels a respectable 20-25 feet. The nozzle dials back to a wide, fine spray setting as shown in the initial photo in this review. The hand trigger is fairly comfortable, albeit with a relatively strong spring that could tire out weak wrist muscles with extended spraying. If you’re not in the mood for a grip workout, flip the wire clip that you can see on top of the nozzle in the above photo to lock the nozzle in the on position. 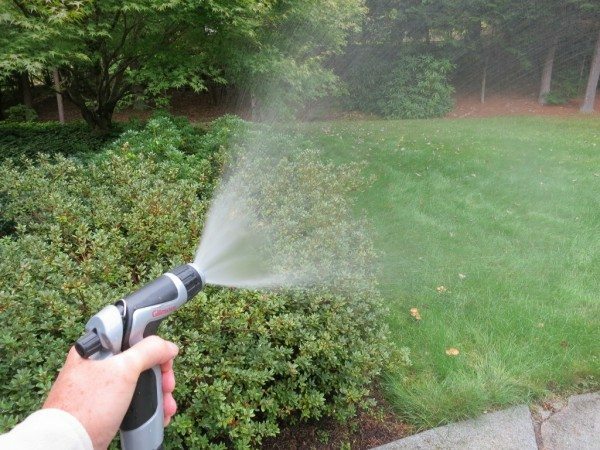 As an owner of cheap nozzles in addition to cheap hoses, I was quite impressed with the solid build of the spray nozzle. It is heavy metal construction with an exterior of both gray anodized coating and black rubberized finish that appears attractive and durable. 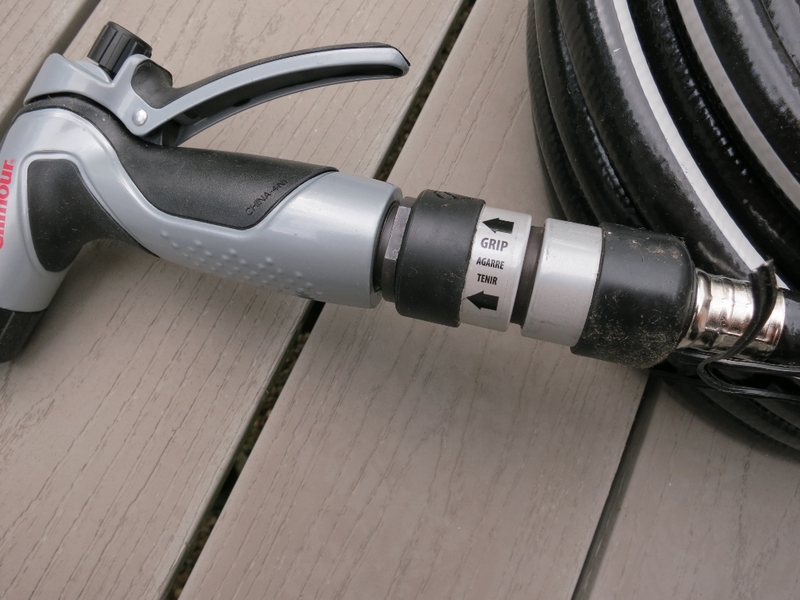 Here is a view that shows the finish on the nozzle and its connection to the hose. Now let’s take a look at the other end of the system. Here is the faucet-to-hose connector. This is intended to connect to the faucet on the side of the house. Note that everything downstream of this connector must be a LeakFree system component because no more threaded connections are available (and there is no adapter sold to transition back to a threaded connection). So you need to be prepared to commit to buying into the whole system, probably mothballing all your old hoses and accessories. This could be a fairly substantial investment, so make sure that you carefully consider the benefits of the LeakFree system. 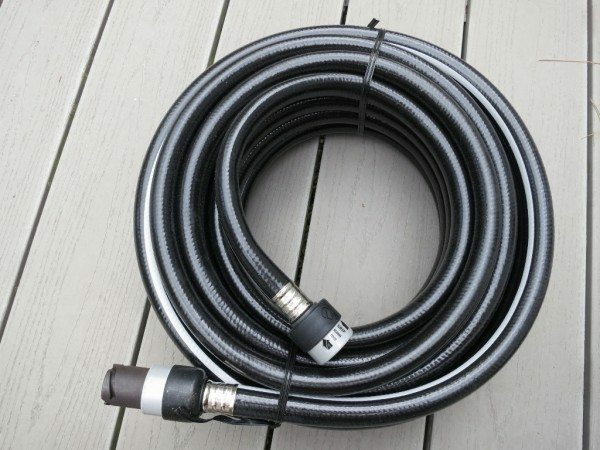 I may decide to put up with the leaky connection with the existing hose (or try adding an extra washer) in order to preserve my investment in the old hose and avoid buying the additional hose needed to reach beyond the fifty-foot length provided in the starter kit. At $45 for 75’ or $55 for 100’ of LeakFree system hose, the extra cost is not insubstantial. Likewise, the attachments range from $25 to $35 – the LeakFree feature appears to add about $10 to the cost of comparable attachments made by Gilmour. Although I expect that they are made to the high quality standard that I found in the starter kit components, be sure that either the quick and convenient attachment switching or the leak-free connections are important to you. 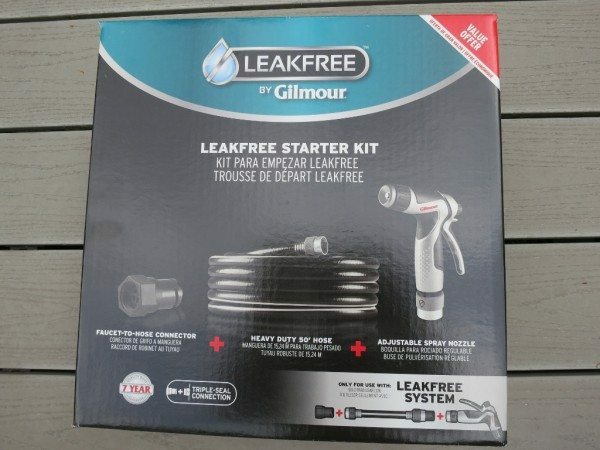 If so, I can highly recommend the Gilmour LeakFree system. And I will be sure to find a nice, warm place inside to store mine this winter! For anyone who was worried, the Gilmour LeakFree garden hose made it safely inside before the snow flew. I’ll definitely be bringing it out when spring fever hits. Source: The samples for this review were provided by Robert Bosch Tool Corp. Please visit their site for more info about this product. I bought the hose kit along with a 75 foot hose. I found them to be good hose and nozzles. The only drawback I cannot find any hose to nozzle ( male) adaptrers to replace the one my great pool builder’s broke. I have looked at all the Lowes stores and they do not carry them. 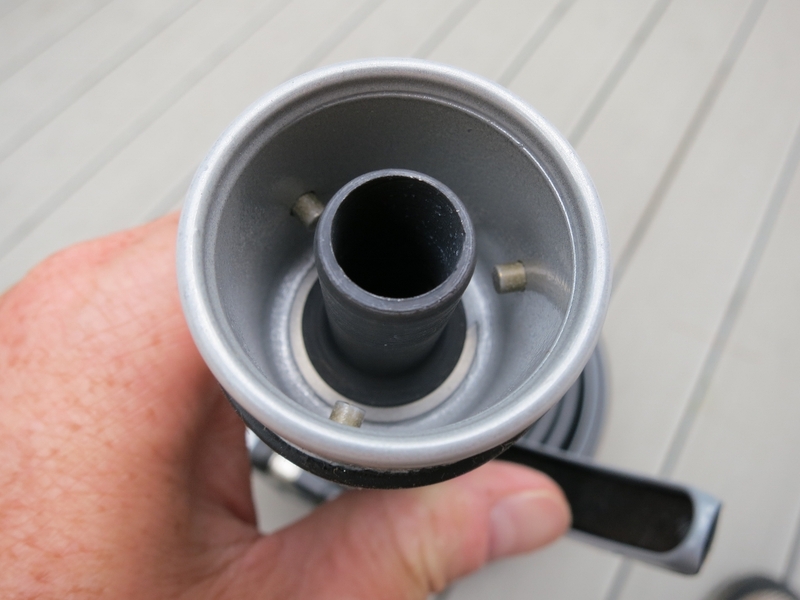 I’m most disappointed as the system seems a vast improvement over the old hoses but lacks one important ingredient. 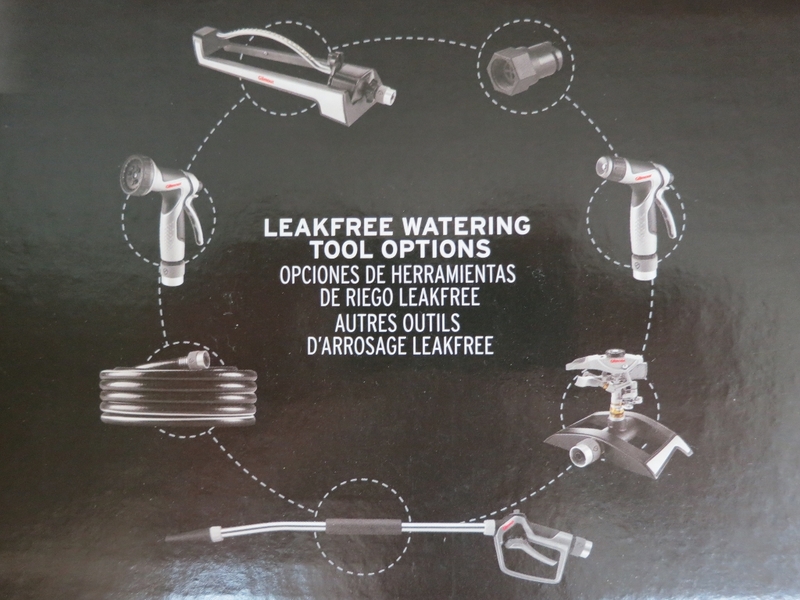 @Robert M: Do you mean the faucet-hose adapter from the threads to the hose (or nozzle)? That’s the only adapter I’m aware of, and it is sold separately on Amazon for about $10. Sorry for my confusion, but “male” didn’t clarify things for me. 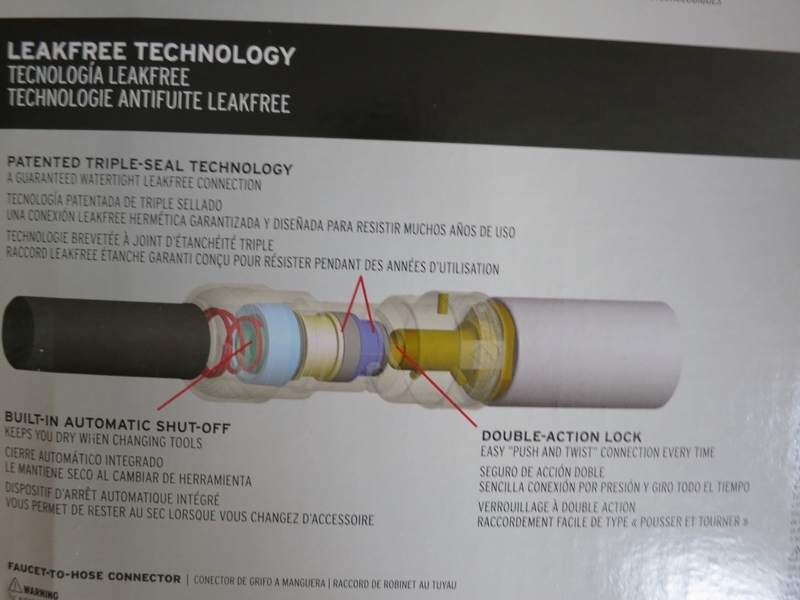 When I wrote the review I gave up trying to decide which side of the LeakFree connection was which gender! Nicholas, we don’t sell products on this site. We are a news and review site. For parts, please contact Gilmour directly.